The two Chinese zodiac signs of the tiger and the rabbit might be too different. The rabbit will adore the tiger’s allure. The tiger will need to keep their relationship calm and easy. Only then will this Tiger and Rabbit relationship become exciting. The tiger and rabbit in love will not have a power struggle because the tiger will usually win. However, both are compassionate. Because of this, they will be able to communicate better with each other. The tiger is confident, brave, brash, and free. They can also be irresistible, seductive, and alluring. They will need to keep their independence and be in control to be happy. They have a sense of nobility and are kind-hearted. They are very self-sufficient but fickle. The shy rabbit might be pushed over in this Tiger Rabbit friendship. They tend to be quiet and can be taken advantage of at times. At the same time, they are calm, somewhat shy, gentle, and kind. They can be very good lovers. They care about their partner’s satisfaction over anything else. When the Tiger is dating the Rabbit, they might be too different to be compatible. The tiger and the rabbit will have relationship that might not be mutually fair or fulfilling. The two Chinese zodiac signs of the tiger and the rabbit could have a romantic relationship that might be lacking balance. The rabbit will always put everything they can into a relationship. However, they tend to not tell their partner when they feel that they are not being treated well. They continually require to know the status of the relationship and what their position is. They might find it difficult to get the reassurance from their partner. This might lead to a breakup of this love match. The rabbit is emotional and self conscious. They might not like impulsiveness. The rabbit male tends to like more intellectual and artistic goals. The tiger is rowdy and bold. They are lively and somewhat decadent. They will not tolerate a sensitive nature. The tiger man will not purposely treat the rabbit woman badly. The Tiger male and female Rabbit will have to work hard to make the relationship successful. The rabbit will want the tiger to be the dominating mate. Because of this, the tiger will be content. They might be too firm and unusual for their calm, meek soulmate. The female tiger can help the rabbit solve their problems. However, the male rabbit might not want to hear his partner’s solution. The rabbit man could teach the tiger woman to be even more confident and resourceful. However, the lady is dominant and might not want to learn anything from her lover. The Tiger and Rabbit marriage compatibility might be ruined by he domineering nature of the Tiger that might cause arguments between the two. However, the tiger rabbit soulmates can make their different traits work together. Even in bed, the Rabbit and Tiger can make their relationship sexually compatible. 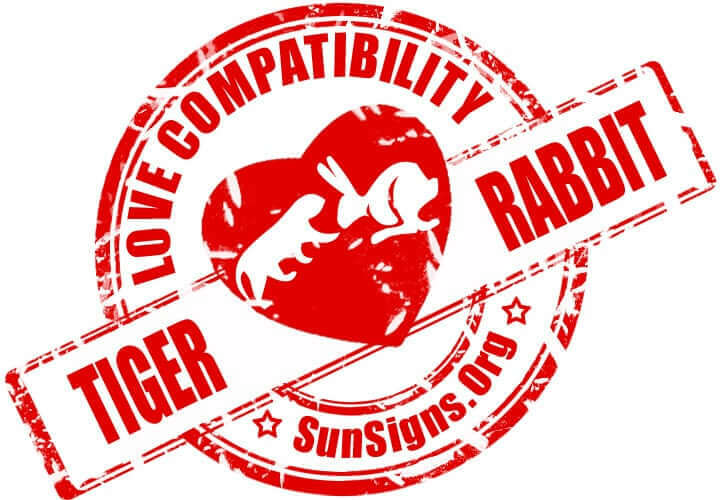 Because of this, the tiger and rabbit love compatibility can actually improve each other. They will need to accept each other’s different traits. These two Chinese astrology signs can learn to have a lot of respect each other. However, they might be more successful as friends than in a romantic relationship. A tiger wife and rabbit husband will be very aware of each other’s flaws. Because of this, they might have a lot of disagreements. A tiger husband and rabbit wife will enjoy good marriage compatibility as he will be happy to come home at the end of the day to a gentle wife. Tiger & Rabbit Chinese Horoscope Compatibility Rated 4 Hearts! I need a the most suitable wedding date for me as a tiger male and my partner rabbit for the year 2017 and 2018..